New bicycle models, including electric and adult tricycles, plus the popularity of biking trails and paths, offer new options for older adults who want to keep riding into their golden years. When Martha was 80, she wanted to ride a bicycle again but wasn’t sure her balance was good enough. Because she was otherwise strong and fit, her children bought her a “three-wheeler,” and Martha was able to cruise the local pedestrian/bicycle creek path in her town, enjoying the freedom of riding outdoors. And then there’s “oldsters“ like Howard Dietzman, 81, who last year did a solo bicycle trip across Canada, his second, which was preceded by three rides across the United States. That doesn’t count the bike tour he did from New York to Alaska (Biking Bis). 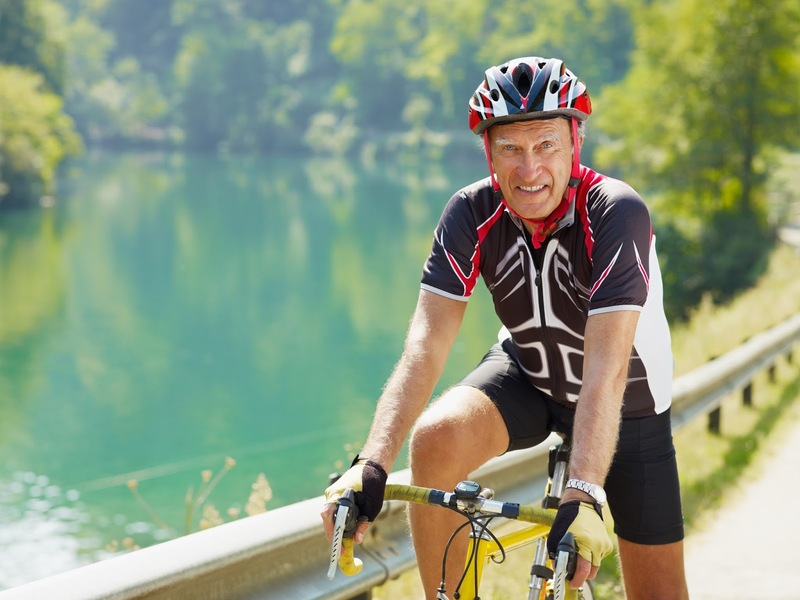 Bicycle riding is proving popular with older adults. Biking rates among people between the ages of 60 and 79 are soaring, an analysis of federal data shows. New trips by seniors account for 22 percent of the nation’s growth in adult biking (People for Bikes). One likely reason for the increased popularity in bicycle riding is that you can ride many other places besides in traffic. Many cities and towns have added separate bike lanes on streets, or bike paths that keep you out of the way of cars. Bike-friendly towns, such as Seattle, provide a map of bike routes through and around the city, labeling them as far as difficulty. In fact, Seattle and other cities have bike share programs, which provide bikes for locals and tourists to rent and use. Crossing through the countryside are scenic trails. The Rails-to-Trails Conservancy transforms unused rail corridors into multi-use trails that transverse open prairies, mountain passes, canyons and along rivers. You can join a bicycle club aimed specifically at seniors, such as California’s Claremont Senior Bicycle Group (which has its own website). Its list of planned bike rides shows these are not just spins around the block. Luckily, most rides have a destination that serves food. One week, riders on Monday took a moderate 20-mile cruise with some climbing, which ended with a breakfast stop. Tuesday, an easy/moderate 30-mile ride finished at the Euro Café for brunch, while Thursday, riders huffed and puffed up a difficult 35-mile climb to the Corner Bakery. Cycling has many health benefits. Because it’s not weight-bearing, bicycling has little impact on your joints. That’s why people are able to comfortably cycle in their 70s and 80s. Your legs and backside—the largest muscles in your body—drive the power, which means cycling tones the lower body. For those who want to lose weight, it’s great at burning calories. Even moderate cycling—riding 12-14 mph—burns more than 500 calories in only 60 minutes. And biking’s easy to fit into your daily routine. You don’t have to drive somewhere to do it and can use it as transportation. Bicycles have come a long way from the three speeds, with coaster brakes, that we rode as youngsters. Now you have your choice of 21 speeds. Not only is there a huge variety, but many bikes offer just what older adults might want: cushioned seats, upright handlebars or a power boost on uphill climbs. Prices can vary from hybrids and cruisers at $300 to $705, to a recumbent for about $700-$5,000, to electric bikes priced from $600 to $1,500. Hybrid bicycle. This combines some of the best features of a road bike with some attributes of a mountain bike, making it extremely versatile. Many older adults can’t physically stay in the crouched position that a road bike demands, nor tolerate its narrow, hard seats. Meanwhile, mountain biking can be physically demanding and more suited to young bodies. Hybrid bike tires are cushier and less rugged than those on mountain bikes, but wider than the hard, skinny tires on road bikes. Handlebars are higher, providing a more upright riding position than a road bike, and the seats are padded. Cruiser bike. The handlebars for these bikes are totally upright, letting riders “cruise” and enjoy the surroundings. With only a single speed, these are not meant for long and difficult rides, but for an occasional leisurely spin around the neighborhood or down to the grocery store. Cruisers are most like the three-speed bicycles of our youth. Step-through bikes. With no cross-bar to lift legs over, step-through bikes are easier to mount and dismount, especially if you have balance issues or are not as flexible as you once were. The EZ boarding bike has an even lower “threshold” to step over when getting on your bike. Recumbent bike. Sitting in a reclining position takes stress off the lower back, hands, neck and pelvis. Because you use different muscles than on a conventional bike, you’ll need to adjust to a slightly different style. Although the recumbent bike rider looks relaxed, these bikes are actually faster than a traditional bicycle because the “laid-back” position means less wind resistance. They come in a variety of configurations, including no-hands steering, rear- or front-wheel drive and a three-wheel arrangement. Electric bike. This is a good bike for older adults who love bike riding but have physical issues that make hills or other types of terrain challenging. You can pedal until you get tired and then use the motor to climb a steep hill. On a single charge, the bike can go up to 20 miles at 15 mph. Adult tricycle. These are becoming so popular that adult tricycles come in many different designs, including a semi-recumbent and electric version. With its step-through design, it’s easy to get on and off, and the adult tricycle offers a stable ride. Because you sit upright, this bike is easier on the back, buttocks and hands. The only difficulty you might have to contend with is a few sneers from the younger set on their sleek road bikes. Other bike types to consider have automatic transmissions; are tandem or “built for two,” which provide two human power sources and are great for couples; and are “foldable,” perfect for those who don’t have a lot of space to store a bike, either at home or in your RV. Don’t Let Age Keep You from Bicycling was featured in the September 2015 Senior Spirit Newsletter.